Jan Molam : Pet Phin Thong - their debut record (HLP 260), full album! Here is a gem from the Phet Phin Tong Band, issued on the Phet Phin Thong Label. The Band uses 2 Khaens (the mouth-organ carried by the players left and right on the cover) and the Phin, a 3-string guitar (seen in the center). For support some drums are added (Glong Yao, Thai longdrums), creating a hypnotic and driving beat that pushes harder than any funk number I know of. Usually the songs start slow and then pick up speed. I assume this record is from the early or mid-seventies. 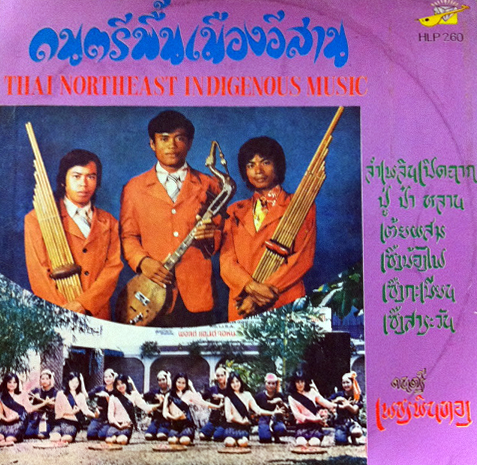 Several Tracks are "Lam Ploen" style, a music that is original from the area of North-East Thailand and has developed from very early forms of Khaen playing and singing. With the arrival of american soldiers in the sixties and tours of western pop-bands (The Shadows were huge in SEAsia!) these traditional forms of Thai music were played more and more danceable - other bands used western instruments (guitar, bass, drums) and combined them with thai instruments, creating exciting hybrid sounds. Enjoy this instrumental groovy monster and excuse me for just creating one audio-file...! wow! Manchmal hört man ja noch ähnliche Musik, z.B. bei Umzügen (in Ubon, beim OOK PANSAA Fest...), und in Yasothon (Bang Fai Ysaothon)... bin dann immer ganz begeistert. Kennst du denn die "Paradise Bangkok International Molam Band"? Tipp! glad that you like it! I will post lots more! Nice gems Jan! Actually if you look carefully to Tongsai Thapthanon 's phin you will notice that there are just two strings, while most of phins, as you said, have three strings. Why? "Cause it's easier to play" said Master Tongsai. Glad i discovered your blog! Thanks for the post, old Thai music hard to find online.. Maybe you know any Thai based online shop that sells old Thai records? Thanks in advance..
great band and album, would you help to post the band's other two album HLP 262 and 264? thanks in advance! here you are! I post HLP 264 first, HLP 262 will follow some time later! Nice album, thanks for posting it, my wife is sitting next to me singing along as I'm listen to it. I posted another one from Pet Phin Thong today - enjoy!